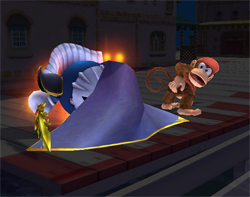 This morning’s Smash Bros. Dojo update displayed Meta Knight’s final smash. He swirls around his cape, does some other crap, everything gets dark, and finally someone gets sliced by his sword. I think I’ve already seen this on video, anyway, so reading about it isn’t exactly exciting.